This week I was honored to speak at the University of Illinois at Urbana-Champaign. These speaking engagements were different than anything I’ve ever participated in. I’ve done quite a bit of university speaking, but generally conferences. These events were different because the students themselves from these two Houses invited me and funded my visit. To say I felt a great obligation to find a way to connect to them is an understatement. Normally my audience consists of genealogists, and sometimes civic groups, but generally not young people ranging in age from 18 to 22 or so, plus grad students. These folks were born in the 1990s for the most part and ancient history to them is anything before cell phones. They were only about 10 years old when social networking in the form of My Space was launched, so they’ve never know a world without the internet, electronic gadgetry and social networking. I was extremely glad I had my two blogs to offer them. I thought about how they might perceive DNA and genealogy, and I changed the presentation entirely, approaching it from a different perspective – that of personal genetics. While this new field started in 1999 as a genealogical endeavor (thank you Bennett Greenspan), it has moved far from its original genesis. Today we have a toolbox full of tools that can answer different questions for us, in various ways. For these bright young people full of potential, personal genetics will be with them their entire lives and it won’t be a frontier like it is for us, but a way of life. 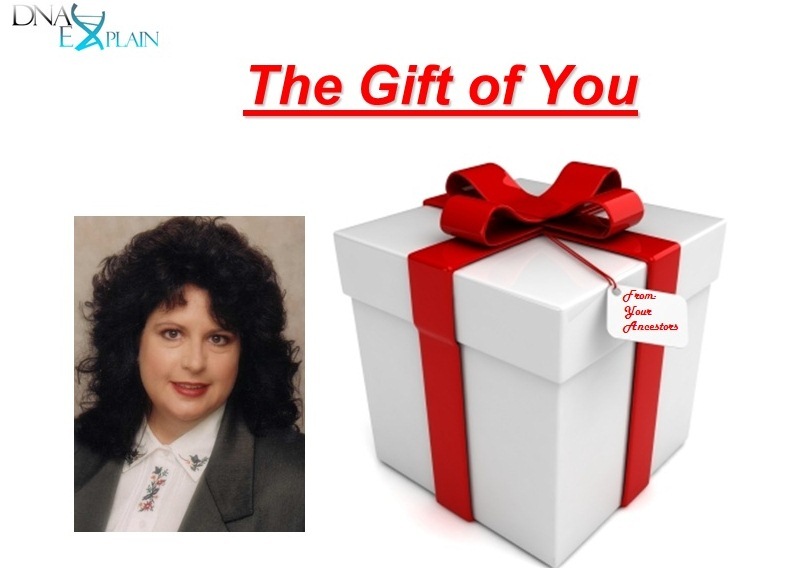 My presentation was entitled “The Gift of You” and it discussed genealogy of course, but deep ancestry, health, ethnicity and “cousinship” using fun examples. I also passed out candy when I got answers, which helped a lot:) Food, the most common denominator. While all 4 sessions were sponsored by both the African American and Native American Houses, 2 sessions were held at the Bruce B. Nesbitt African American Cultural Center, 1 at the Native American House and the final presentation in a larger auditorium venue. All sessions were open to all students and the public as well, and indeed were attended by a wide variety of people with very interesting and diverse backgrounds. I was particularly impressed with the regular luncheon, with speakers, held by the African American House, entitled “Food for the Soul.” I wish I lived close enough to attend as many of the topics are very interesting. This event was very well attended. After each of the 4 sessions, several people stayed and discussed various aspects of genetic testing, genealogy and career paths. I can’t even begin to express how hopeful this trip made me. These young people who attended these sessions are bright and forward thinkers. They are involved in supportive and nurturing programs through the two Houses as well as the academic curriculum at the University of Illinois. They are encouraged to reach beyond the known horizons. And yes, some of them are interested in genealogy too. I’m hopeful that there will be someone to pass that torch to someday! I want to share with you a conversation I had with one young man who stayed after the session at the Native American House. He is mixed Caucasian, Peruvian, Chinese and Jewish, born in California, an extremely culturally diverse place. He is a graduate student in the Communications/Medical program meaning at the end of 8 long years, he comes out the other end with an MD degree and a PhD. And he is bright, very, very bright, compassionate and pleasant. I don’t know where he’s going to practice, but I want him to be my doctor! I told him, I’m way beyond my level of expertise, but the fact that this extremely talented young man is pondering this question, and has a very personal impetus to answer it is one of the most promising and hopeful events I’ve witnessed in a very long time. This truly is the gift of our ancestors, in so many unseen and unspoken ways. The art at the beginning of this article, titled “Elevator”, by Sol Aquino, 2003 (acrylic on canvas) featured on the SACNAS brochure I picked up at the Native American House portrays this connection is a most profound way. During these two days, I got to spend time with Rory James, the Director of the Bruce B. Nesbitt Center, and with Jamie Singson, the Director of the Native American House, and the staff and volunteer students at both facilities. I was extremely impressed with the knowledge of both of these gentlemen and their heartfelt concern for the students, their education and their futures. I know that these men and their staff will shepherd these students and provide them with ongoing opportunities to learn about their history and how it connects with their futures as they complete their more structured academic studies. I wish facilities like this had been in place when I was a student. The attendees were extremely diverse, in terms of racial and cultural makeup, in terms of student versus community members, age, and in terms of their interests relative to personal genetics. Their stories were both amazing and inspirational. This entry was posted in Admixture, African, Education, Ethnicity, History, Jewish, Native American by Roberta Estes. Bookmark the permalink.